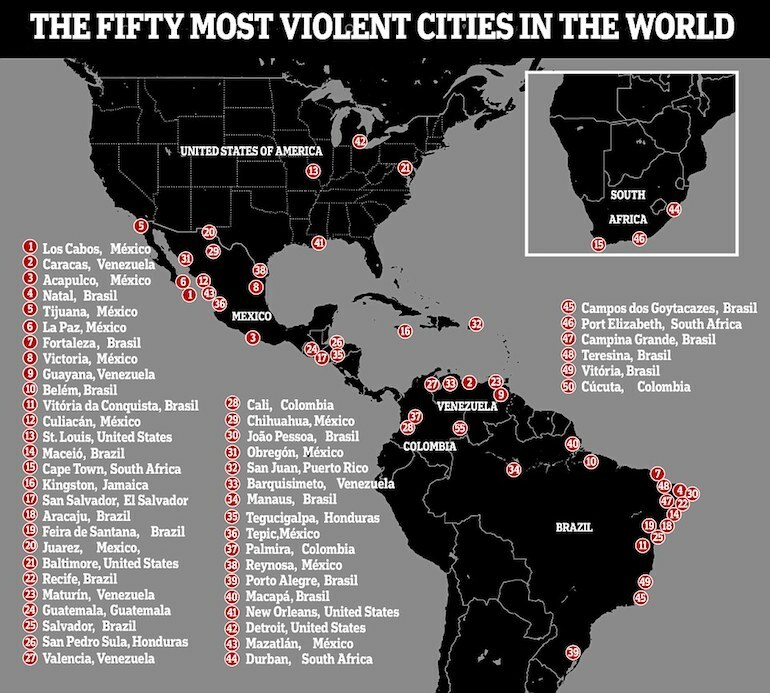 Here’s ‘The 50 Most Violent Cities In The World’ – Here’s Our Problem With This List | What Did You Say? The list was compiled by an anti-violence Mexican think-tank organization called Seguridad, Justicia Y Paz (Security, Justice, and Peace). Each city is ranked according to homicide rate per 100,000 residents. It’s no surprise that Bernie’s Socialist Utopia, Venezuela, is on the list as the country has been descending into ‘chaos’ for years. South and Central America dominate a list of the most violent cities on earth, with the United States and South Africa also making an appearance. Los Cabos, in Mexico, has been named the most violent city in the world according to a new report, with Caracas, in Venezuela and Acapulco in second and third. Of the top 50 cities, 42 of them are in South America. In the United States, the cities of St Louis, Baltimore, New Orleans and Detroit also made the list, with Cape Town, Durban and Nelson Mandela Bay, of South Africa, appearing in the top 50. Jamaica, Honduras, Puerto Rico, Colombia, El Salvador and Guatemala also featured. South and Central America do indeed dominate the list. Here is the visual provided. Do you notice anything missing? Think about where it is that isn’t included. There’s not one city in Western Europe listed despite violent crime rising there. Nor does it include any countries that are radical, totalitarian Islamic Suckistans. That just doesn’t seem right, does it? As for the four American cities listed, they do have something in common — they’re all Democrat Strongholds and many of them have been for a long time. St. Louis, the first of the four American cities listed, has been Democrat-run for decades. St. Louis has been electing Democratic mayors since 1949. The Gateway to the West has become the gateway for crime. Law Street says that it’s the fourth most dangerous city in the country, Forbes says it’s the second. It had the sixth-highest poverty rate among big cities in 2014. Baltimore is the next U.S. city on the list and no one is surprised. Both Baltimore and Oakland had Republican mayors as late as the 1960s. In the era of Democratic rule, both are now more well known for their crime and poverty problems than for their charm and character. New Orleans and Detroit are at 41 and 42 respectively. Detroit last elected a Republican mayor in 1957. It is now the model of urban failure — it’s recognized more for its poverty, crime, rot and bankruptcy than the great cars that it turned out into the early 1970s. It is the poorest big city in the nation, with almost 40% of the population living below the poverty line. The website Law Street actually ranks Detroit ahead of Flint as the country’s most dangerous city. Either way, it’s clear that both cities have institutionalized crime problems. Detroit is also a pit of political corruption. Just in recent years, one mayor, Kwame Kilpatrick, was convicted of corruption and sent to federal prison for 28 years, while building inspectors have been indicted on federal felony bribery charges and a former city council member was investigated in a bribery and kickback scandal. New Orleans has elected Democrat after Democrat as mayor since 1872. Democrats are good at turning great cities into sh*tholes and somehow convincing voters to reelect them. Art Of The Deal: Has Trump Just Solved The North Korea Problem?